Celebrate Mother’s Day with Deliciousness! Every mother deserves lots of pampering. After all, our mothers literally spend most of their lives taking care of her family every day. This coming Mother’s Day, it’s the perfect time to take her out for some delicious pampering moment at Zuan Yuan Chinese Restaurant, One World Hotel. 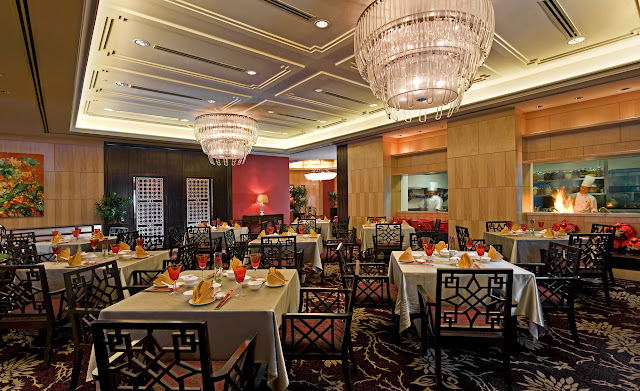 Serving refine Chinese cuisine set in an elegant Oriental ambiance, Zuan Yuan’s Chinese chef Lee Siew Hap goes classic prepared with lots of premium ingredients and created three special set meals of Joyful, Lovely and Superb for this special celebration. The Mother’s Day special set menus are available from 2 May to 10 May, 2016 for lunch and dinner. The simple but perfectly executed dish of Sautéed Prawn with Green Soy Bean in Garlic Sauce won many hearts that evening. The prawns were so beautifully sweet and bouncy that it literally won us with its freshness. It was a clever thought to allow the prawns to shine with its freshness and sweetness and the nuggets of bright green soy beans added nutty and cream note to the dish. One simply cannot go wrong with this all-time-favorite method to enhance the freshness of a beautiful fish. Our Steamed Tiger Garoupa with Bean Curd and Soy Sauce was steamed just right. The flesh is flaky and soft with a sweet creamy note. The light soy sauce gave the fish its signature flavour. Its dish that will definitely be appreciated by many, especially moms. Keeping to its theme, the vegetable course also showcased simplicity in Braised Mushroom and Assorted Vegetables with Conpoy Sauce. The dish is a nice changed from being the usual ones drenched in brown sauce. The vegetables are crisp and naturally sweet while the braised fresh Shitake is superbly juicy and earthy in flavours. The crispy dried scallop was definitely the crowning glory of the dish. Egg Noodles with Sauteed Crab Meat, Egg and Bean Sprout was the finale of the savory course and it was deliciously light, tasty and satisfying. I would be happy enjoying this dish daily. It was an unexpected presentation of Chilled Mango Puree with Pomelo and Sago with Vanilla Ice Cream and Mini Crystal Longevity Bun. The modern presentation really was so pretty to look at. Both desserts are crowd pleasers with its chilled sweet fruity flavours as well as fluffy bun with creamy filling. 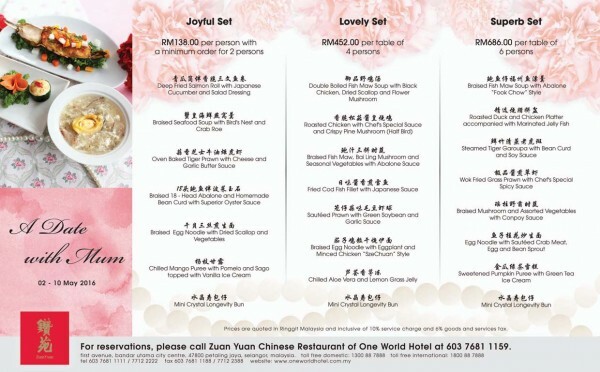 Zuan Yuan Chinese Restaurant Mother’s Day set menus are available for lunch and dinner from 2 to 10 May 2016 at RM138.00nett per person with a minimum order for two persons, RM452.00nett for 4 persons and RM686.00nett for 6 persons. Saw this in Issac's blog, I think. Was wondering about the Fook Chow - is that Foochow, now spelt Fuzhou? In Hokkien, we say Hock Chiew. Maybe they want to single out the "Fook", for good luck. Pretty decent pricing for what they offer I think, nothing beats classic Chinese dishes esp. when it rains out. On this year’s mother’s day, I took my mom to one of my favorite food venues. She liked the place very much and told that we will visiting there again. I was really happy that she liked all arrangements and efforts I had put.